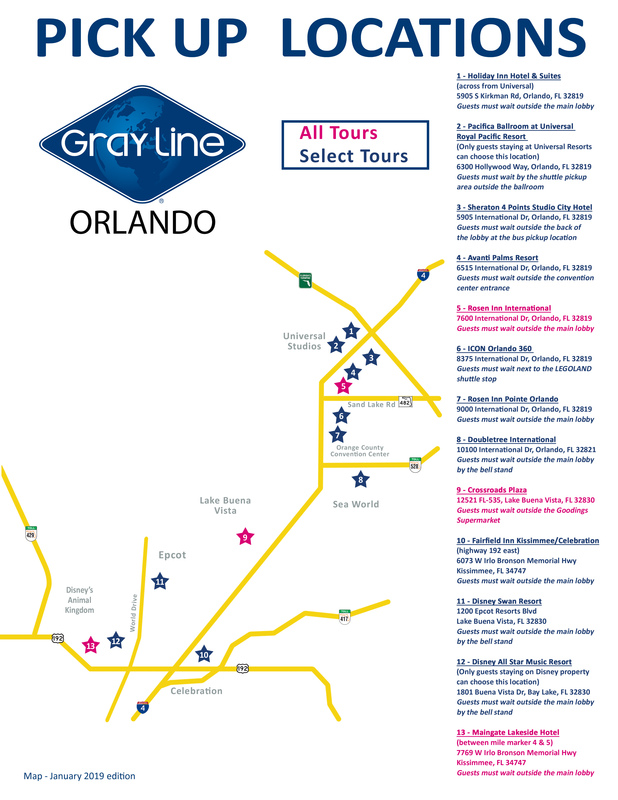 By riding the Gray Line Orlando bus, you will receive an exclusive welcome from an astronaut upon arrival at Kennedy Space Center. Only Gray Line guests have this meet and greet option, and it is an excellent added benefit. Should the meet and greet not be available, then there would be no refund as there are no surcharges for this great enhancement to your tour day. Currently from summer 2018 the meet and greet usually happens on Wednesday & Saturday mornings due to the astronaut schedules. On all days the astronaut is not available we will substitute with a walk-through tour of the Space Shuttle Atlantis facility. Upon arrival at the main visitor center complex, you have time to visit the world’s most comprehensive attraction devoted to the space shuttle, Kennedy Space Center Visitor Complex’s Space Shuttle Atlantis brings visitors nose-to-nose with the priceless Atlantis spacecraft as only astronauts have seen it before – with payload bay doors open as if it were floating in space. More than 60 interactive, touch-screen experiences and high-tech simulators invite guests to “be the astronaut,” bringing to life the people, passion and patriotism behind NASA’s 30-year Space Shuttle Program as well as the complexity of the engineering marvel that launched the Hubble Space Telescope and built the International Space Station (ISS). Guests can conduct a virtual EVA, or extravehicular activity; practice docking to the ISS; extract cargo from the payload bay; create sonic booms and glide to a landing on the Re-entry Slide; experience the sensation of floating in space; explore a high-fidelity replica of the ISS; virtually mate Atlantis to the external tank; kick up a virtual chemical reaction to launch the shuttle; get an “X-ray view” of Atlantis’ interior; experience an orbital sunrise; strap in to the sights, sounds and sensations of a shuttle launch; take the helm at the shuttle cockpit, and much more. 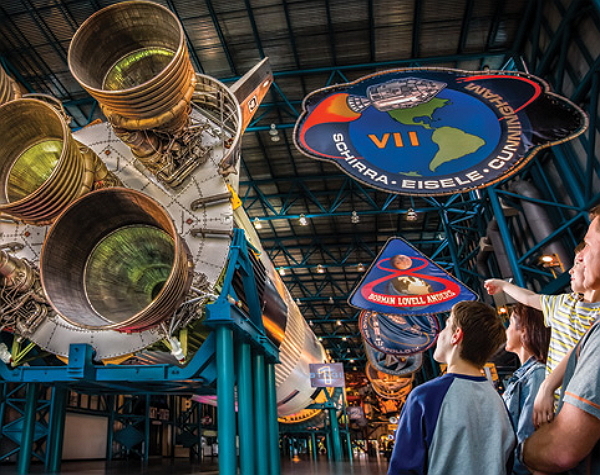 After Space Shuttle Atlantis, you can explore one of the many other exhibits such as Heroes and Legends, sit for a minute in the IMAX theatre to catch one of the 2 films showing, visit the Saturn V Rocket or much more. You will also be provided with a ticket and time of your KSC Explore bus tour. This will take you beyond the regular bus tour on a 2-hour journey through the NASA grounds. Sometimes it even stops at launch sites and the Vehicle Assembly building for a photo op! 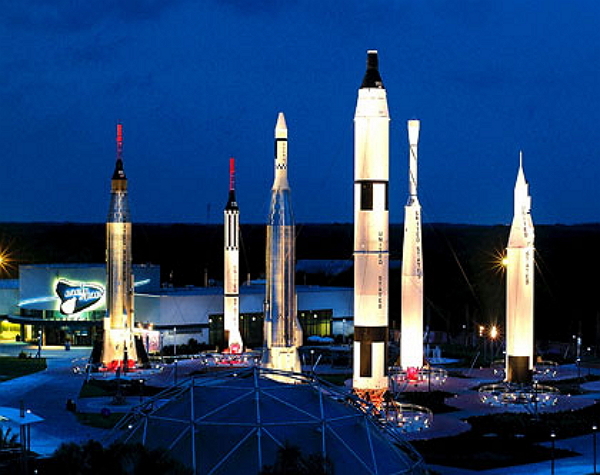 This tour is for those who want all the information possible about the NASA grounds and Kennedy Space Center! 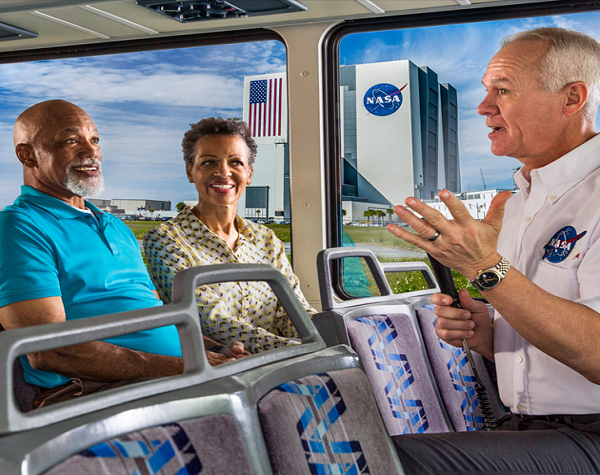 Explore Bus Tour: Dependent on availability with Kennedy Space Center. Guests will be notified of time by guide. 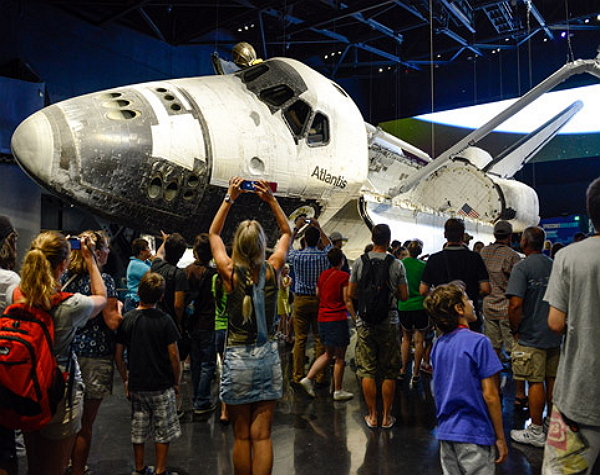 SERVICES AT KENNEDY SPACE CENTER: Stroller and wheelchair available. Electronic Translator Systems available for hire. Hard-side coolers, luggage or other large bags, fire arms of any type, ammunition, pepper/mace sprays, knives, box cutters or like items, daggers and similar edged weapons. laser pointers, large beach-type umbrellas, on-property cooking or grilling items, any other sharp/pointed items are not permitted at the KSC Complex. Guests must note that The Visitor Complex has magnetometers similar to an airport. Please be prepared to have your personal items inspected. All timings are approximate and subject to change. Food and drinks are included only when noted in the inclusions. No other food or drink is included within the tour product and guests are advised to take money to purchase them as necessary. Gratuities are not included for the tour guides or drivers. Many guests often ask us what a normal gratuity is, and we regularly state $2 per person for the tour driver and $2 for the guide. 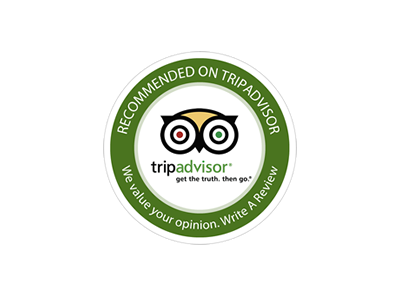 Gratuities are not mandatory but are encouraged upon receipt of good service. If you require a wheelchair, please be sure to tell us. There are 2 forms of wheelchairs: collapsible manual chairs, and non-foldable electric wheelchairs. It is very important to know what type of chair you will be travelling with. There are multiple vehicles with wheelchair lifts and these can normally accommodate wheelchair bound clients; however, the vehicles need special reservations. 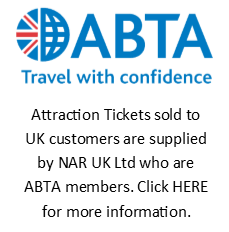 Be sure to confirm this with us at time of booking, as we need to ensure the vehicle is available when you would like to take the tour. Please see below map for pick up locations. We will select the nearest point to your accommodation. Please note that not all locations are avilable for every tour.